January 1947: he makes his first appearance on stage, at the Tôkyô Gekijô, where he receives the name of Ichikawa Danko III and performs in the dance "Ninin Sanbasô". April 1960: premiere at the Kabukiza of Hagiwara Yukio's dance-drama "Onizoroi Momijigari"; Danko plays the role of a female retainer, in reality a female demon [casting]. May 1963: big name-taking ceremony for the Omodakaya guild; Ichikawa Ennosuke II, Ichikawa Danko III and Ichikawa Kamejirô I take the respective names of Ichikawa En'ô I, Ichikawa Ennosuke III and Ichikawa Danko IV. The new Ennosuke celebrates his shûmei by playing in the dance-drama "Kurozuka", the jidaimono "Kamakura Sandaiki" and the michiyuki "Yoshinoyama". January 1964: revival at the Nissay Theatre of Tsuruya Nanboku IV's spectacular drama "Kin no Zai Sarushima Dairi"; Ennosuke plays the roles of the musume Okiyo (in reality Princess Kiyo), Fujiwara no Tadabumi, the shirabyôshi Hanako (in reality the ghost of Princess Kiyo) and the kyôgenshi Masuroku (in reality the ghost of Tadabumi) [casting]. July 1966: first program for the Shunjûkai; revival at the Tôyoko Hall of the drama "Taiheiki Chûshin Kôshaku". April 1968: Ennosuke performs for the first time a chûnori exit for the role of the fox Genkurô at the end of the "Shi-no-Kiri" scene of the classic "Yoshitsune Senbon Zakura", which is staged at the National Theatre. May 1968: revival at the National Theatre of "Ura Omote Sendai Hagi"; Ennosuke plays the role of Arajishi Otokonosuke [casting]. April 1976: revival at the Meijiza of Katsu Genzô III's drama "Ogasawara Sôdô"; Ennosuke plays the roles of Okada Ryôsuke, the yakko Kikuhei (in reality the fox of Mt. Myôjin) and Ogasawara Tôtômi-no-Kami [casting]. April 1977: revival at the Meijiza of Katsu Genzô II's drama "Kimi-wa-Fune Nami no Uwajima"; Ennosuke plays the roles of Date Tôtômi-no-Kami, Yanbe Seibê, the yakko Dôsuke and Takino [casting]. May 1977: revival at the Minamiza of Katsu Genzô III's drama "Ogasawara Sôdô"; Ennosuke plays the roles of Inugami Hyôbu, Okada Ryôsuke and the yakko Kikuhei (in reality the fox of Mt. Myôjin) [casting]. July 1977: revival at the Kabukiza of Katsu Genzô III's drama "Ogasawara Sôdô"; Ennosuke plays the roles of Inugami Hyôbu, Okada Ryôsuke and the yakko Kikuhei (in reality the fox of Mt. Myôjin) [casting]. April 1979: historic revival at the Meijiza of Tsuruya Nanboku IV long-forgotten play "Haji Momiji Ase no Kaomise" (commonly called "Date no Jûyaku", in English "the ten roles of Date"), whose plot and characters belong to the "Meiboku Sendai Hagi" and "Kasane" worlds. The play is produced by Ennosuke, who plays the ten hayagawari roles [casting]. July 1980: revival at the Kabukiza of the never-performed 5th act of "Yoshitsune Senbon Zakura"; Ennosuke plays the role of Satô Shirobyôe Tadanobu [more details]. April 1981: premiere at the Meijiza of the dance "Taikô Sanbasô", which is staged within Nagawa Shôsuke's drama "Sennari Hisago Mashira no Kaomise"; Ennosuke plays the role of Toyotomi Hideyoshi performing the sanbasô's dance. July 1981: revival at the Kabukiza of Tsuruya Nanboku IV's drama "Hitori Tabi Gojûsan Tsugi"; Ennosuke plays the roles of Yurugi Daigaku, the umakata Sankichi (in reality Tanba Yohachirô), Omatsu, Osan (in reality the spirit of the Cat Demon), the hinin Edobei, the ghost of Omatsu, Nippon Daemon (in reality Tanba Yohachirô), the decchi Chôkichi, Shinanoya Ohan, the courtesan Yukino, Okinu, Benten Kozô Kikunosuke, Dote no Dôtetsu, Oshige, the tobi boss Masakichi, the thunder, a ferryman, Kimon no Kihê and Dote no Oroku [casting]. April 1987: Ennosuke produces the revival at the Meijiza of the play "Jûni Hitoe Komachi Zakura", which includes the famous Tokiwazu-based dance-drama "Tsumoru Koi Yuki no seki no To" [more details]. January 1995: Ennosuke takes part in the 14th Kabuki performances at the Asakusa Kôkaidô to celebrate the 100th anniversary of the Shôchiku Company [more details]. 29 June 1998: the Ôsaka District Court slaps an injunction on an unnamed 51-year-old female fan who had been stalking him for the previous six years. She is prohibited from approaching within 200 meters of him, banned from the theaters at which he performs and ordered to pay YEN 500,000 in compensation (text courtesy of Jean Wilson) [more details]. 19 April 2000: Ennosuke performs his 5,000th flying stunt, called chûnori, on stage at the Shinbashi Enbujô, playing the role of Guan Yu in the Super-Kabuki drama "Shin Sangokushi" (New Three Kingdoms). October 2003: revival at the National Theatre with the Omodakaya guild of Nagawa Kamesuke I's drama "Hade Kurabe Ise Monogatari"; Ennosuke plays the roles of Ki no Aritsune and Natora's ghost [casting]. November 2003: Ennosuke suddenly falls ill (first symptoms of a cerebral infarction) while performing in Fukuoka. He has to rest and can't take part in the December kaomise program in Kyôto. February 2004: Ennosuke is back on stage, playing the role of Ichijô Ôkura Naganari in the "Ichijô Ôkura Monogatari" act of the drama "Kiichi Hôgen Sanryaku no Maki", which is the core of the program of an Omodakaya Japan tour. Because of some minor health problems in his lever, Ennosuke decides to rest longer after this tour and stops acting up to the end of 2004. June 2012: Ichikawa Ennosuke III and his nephew Ichikawa Kamejirô II take the respective names of Ichikawa En'ô II and Ichikawa Ennosuke IV at the Shinbashi Enbujô, performing in a special program which celebrates the hatsubutai of both Ichikawa Chûsha IX and Ichikawa Danko V and commemorates the 49th anniversary (50th memorial service) of late Ichikawa En'ô I and Ichikawa Danshirô III [more details]. July 2012: Ichikawa En'ô II celebrates his second month of shûmei at the Shinbashi Enbujô, playing the role of Mashiba Hisayoshi in "Sanmon" [more details]. June 2013: Ichikawa En'ô II, Ichikawa Ennosuke IV and Ichikawa Chûsha IX celebrate their shûmei in Fukuoka at the Hakataza. En'ô is too frail to appear on stage everyday; he performs the 2nd of June the role of Mashiba Hisayoshi in "Sanmon" and makes a short stage appearance, in a wheelchair, for the curtain call at the end of the evening program the 24th of June [more details]. December 2013: Ichikawa En'ô II, Ichikawa Ennosuke IV and Ichikawa Chûsha IX celebrate their shûmei in Kyôto at the Minamiza [more details]. 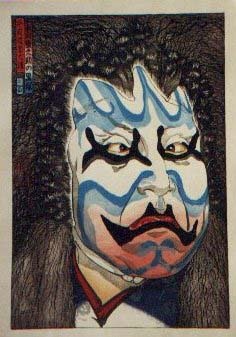 Ichikawa En'ô II was one of the most popular contemporary Kabuki actors. He's still the head of a troupe that started a big revolution against the conservatism of Kabuki. More action, more stage tricks (keren), amazing costums and gigantic stage fights, everything is written in big letters in the Kabuki deviced by Ennosuke. He revived chûnori in an effort to bring back the joy and vigor that Kabuki had during the Edo period. Although it was once scolded by high-brow critics as being a circus-like trick, chûnori has obtained enormous support from contemporary audiences. About 8 million people have seen Ennosuke perform it in various dramas (as of April 2000). Ichikawa En'ô II created his own genre of theatre, called Sûpâ Kabuki in Japanese ("Super Kabuki" in English). It keeps many features of Kabuki, combined with the use of modern language and top-of-the-art stage effects. Ichikawa En'ô II was also famous for the revivals of many long-forgotten plays like the amazing "Date no Jûyaku" (the ten roles of Date), written by Tsuruya Nanboku IV for Ichikawa Danjûrô VII and performed only in the 7th lunar month of 1815. Tobe Ginsaku rewrote the script in 1979 and Ichikawa Ennosuke played the famous ten roles in April 1979 at the Meijiza. It's a tradition for Ichikawa Ennosuke and the Omodakaya guild to be the top of the bill at the Kabukiza every July since 1971. If you're in Tôkyô in July, do not miss the 2 specaculars shows. Ichikawa En'ô II playing the role of the ogress in the dance-drama "Kurozuka"